Last week, I DMed Renee Alexis of Random Bibliophile to invite her to dine out with me. I told her I need some getting out of the house to do else I become a recluse. 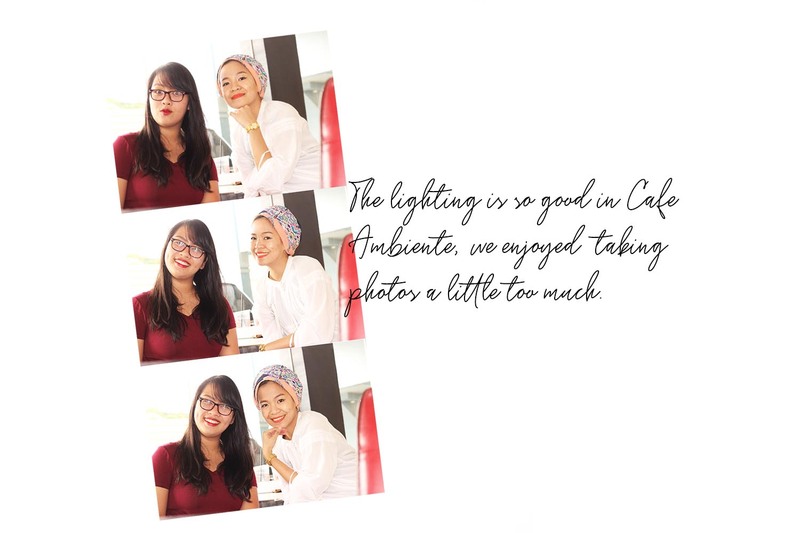 It was her idea that we go try out Cafe Ambiente, a newly opened restaurant in Pala-o. And because we both blog, we decided we are reviewing the place in case any of our readers are interested in going to the place. Renee, by the way, is the other best friend of my bestie Hannah who is away for a year now. I kind of missed her and perhaps this idea of hanging out with Renee is my way of filling in the void she created. 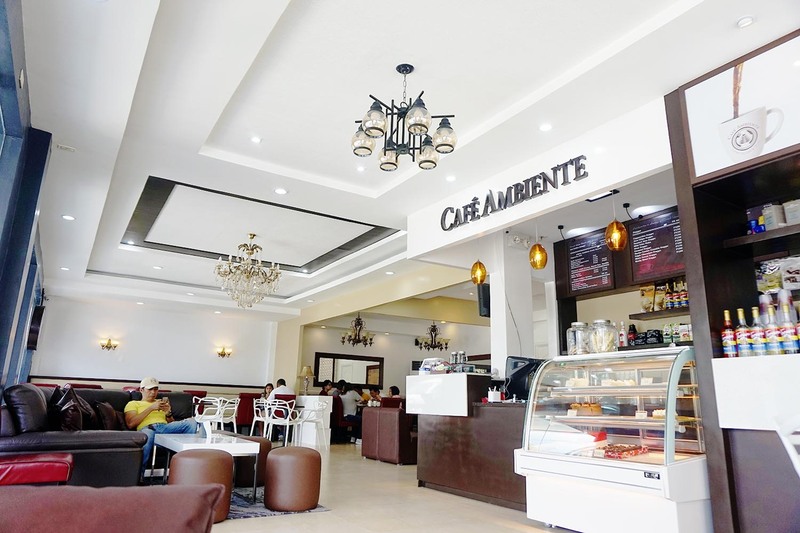 Cafe Ambiente Coffee Lounge and Diner is located at Bellfranz Bldg. in Pala-o, across The Strip. (I'm not a native in Iligan, I have been living here for a year now and I am under the impression that if you are in the mood for food, The Strip area is the place to go. I am yet to try many other diners in the area.) The first thing I noticed is how well-lit the place is. Selfie-ing and Instagramming the food won't be a hassle. It is spacious. Its white walls add to the lightness of the ambiance. The furnishings are a mix of ornate and minimalist pieces. It's clean. It's chic. It's cozy. Cafe Ambiente offers a mix of usual foods and some that are quite unique to this place. They serve appetizers, vegetable sidings, noodles, goat meat, chicken, beef, seafood, pasta, cakes, and salads. For the drinks, they have fruit shakes, coffee, and alcoholic beverages as well. I ordered the salmon steak while Renee had chicken. The food was visually appealing. I didn't like the plate though, I prefer regular round plate over the stylized plate with a separate bowl for the rice. The salmon came with a coleslaw (if I'm not mistaken) which I liked because of the nuts and grapes in the mix. But the salmon could have been moister. The chicken was really good, says Renee. We got watermelon shake and raspberry shake which to me are so-so although they cost a solid 148 pesos. Overall, the food is good. The price is a little up there. The average price on the menu is 250 pesos. An item caught my eye, it's called Ossu Bucco, a main dish that costs 668 pesos. For the two of us, we spent more than 700 pesos. We could have spent twice that have we chosen the more pricey offerings. The service crew were polite to us, they were prompt. They wore nice, clean uniforms. You can tell that they are well-trained. And oh, aren't these cakes lovely? I'd love to go back to Cafe Ambiente. Watch out for more reviews, Renee and I are planning to make this a regular thing for our blogs. 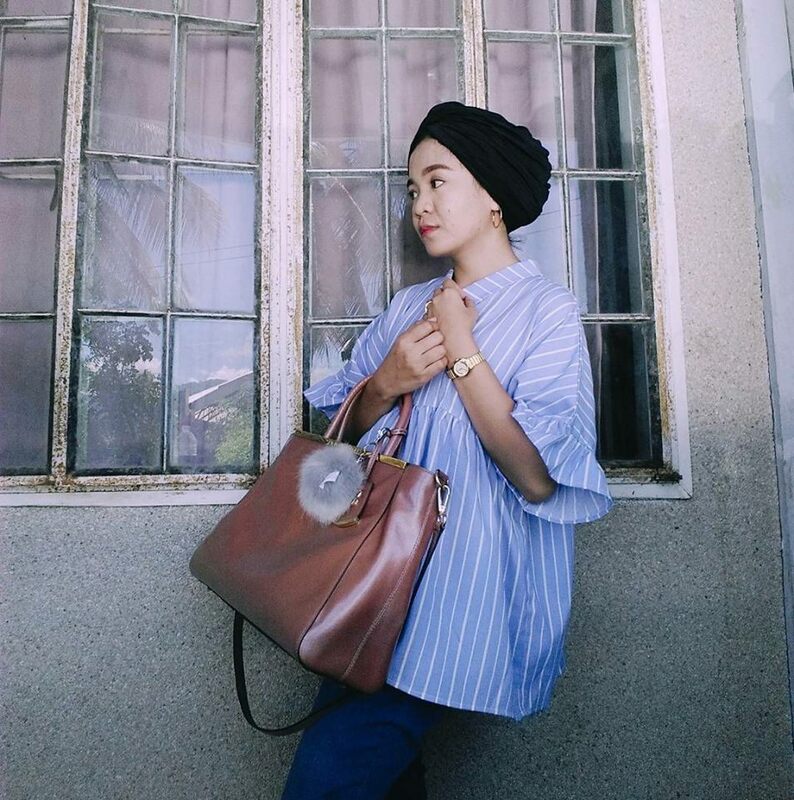 Visit her blog here: Random Bibliophile.